With quite a few new projects underway, and winter work still a couple months away, several of the next few posts, like the spruce, will be bonsai “cliffhangers”. Other upcoming work will include a Japanese Black Pine that has been chronicled over the past 5 seasons, revisits of a Zelkova and Beech shared on BonsaiNut, and maybe some more technical notes on cultivating black pines for bonsai. 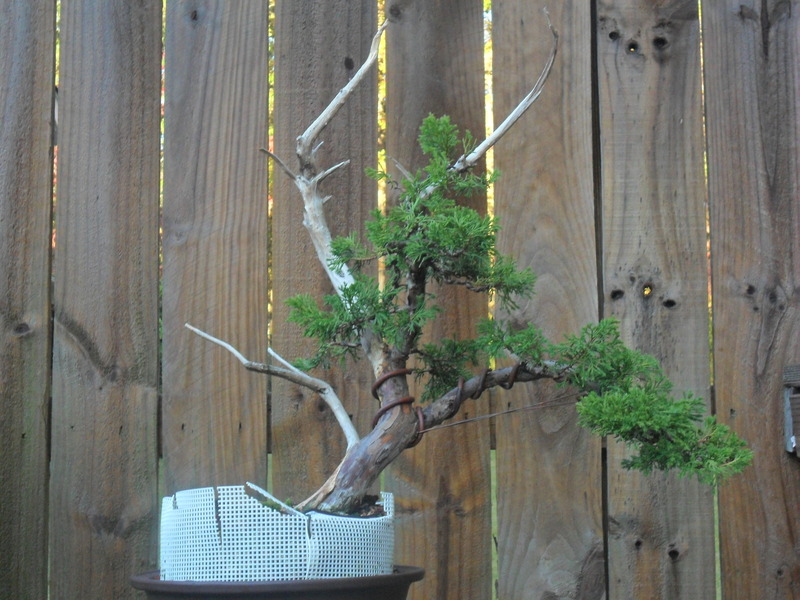 This is an Itoigawa juniper, also from Evergreen Gardenworks. 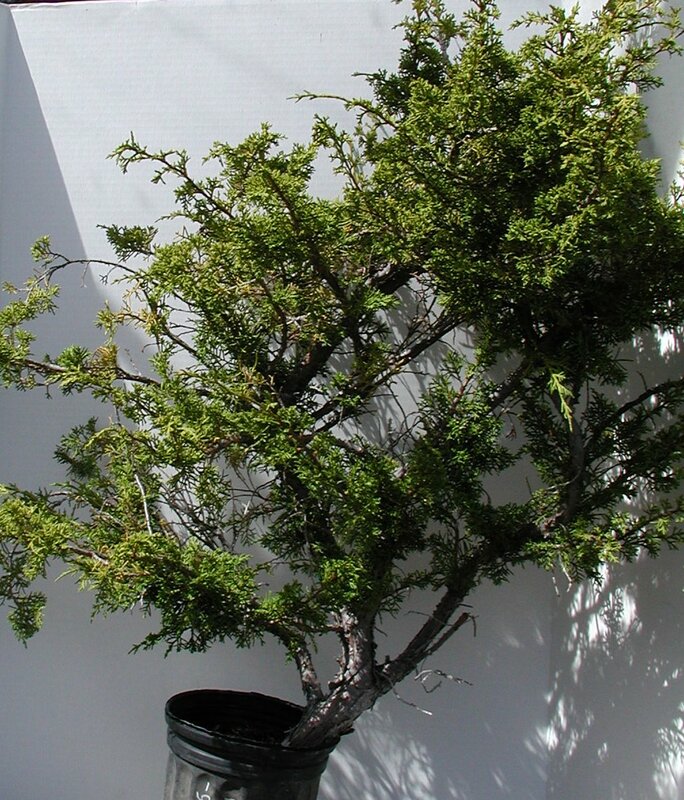 Botanically it’s Juniperus chinensis, but Itoigawa juniper (named for the region it was originally found), is quite different than the Shimpaku juniper. 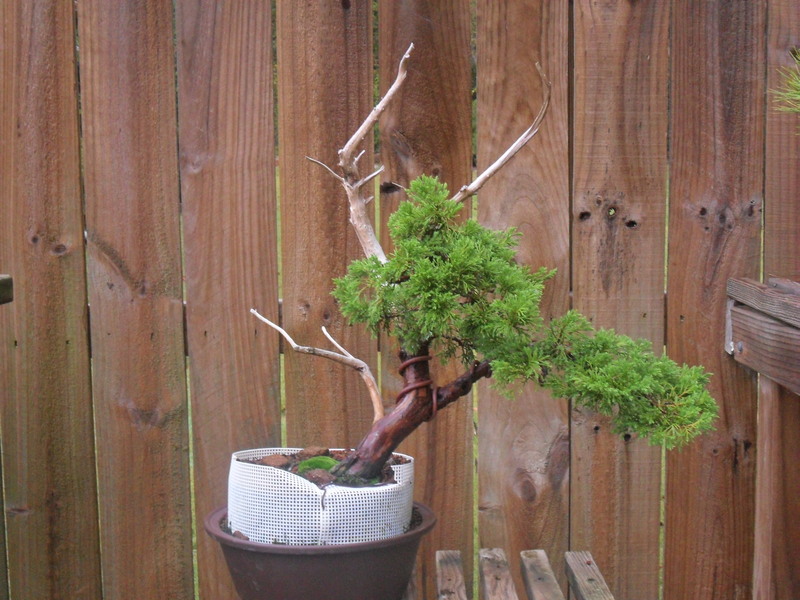 Foliage is bright, light green and is smaller in scale than Shimpaku juniper. 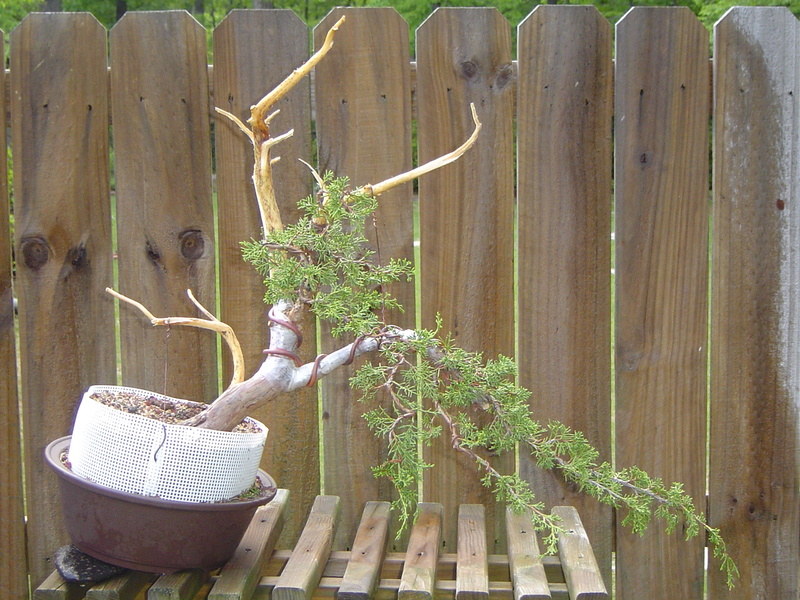 As shown in the photos, it also has a stronger tendency to revert to juvenile foliage after heavy pruning. The bark is also lighter, and a little paler than shimpaku. For years I had an aversion to junipers. This is probably due to my earlier experiences with Procumbens (everyone’s first bonsai), and Virginiana (collected Red Cedars). Both of these junipers were prickly and didn’t seem to do much, if watched on a day-to-day basis. It took about 10 years to get back around to junipers, first with shimpaku, and a couple years later, with this Itoigawa. The foliage is delightful, and the bright color really draws attention to itself. 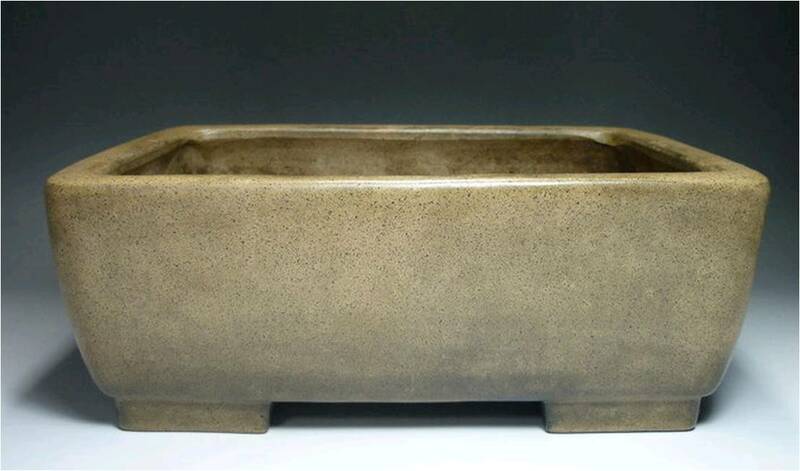 Here is a shot of the Itoigawa as purchased. It’s in a 1-gallon can, that Brent said it’s been in for 15 years. A point-in-case for not repotting too often…but we’ll tackle that another time. At his suggestion, I shifted it to a slightly larger pot; which was too shallow, so I built it up with some plastic mesh. Here is a shot after making some very decisive cuts and wiring this spring. And here is a shot of the tree as it filled out over the course of the summer. It was fed very heavily and responded impressively well to the hard pruning with surprising growth. Finally, here is a photo of it after thinning it out, removing unnecessary growth, pruning it back a little, and redirecting some of the new growth with wire. Next spring, root work will start in earnest. Since it’s been in the 1-gallon can for so long, I spent part of this season aerating the root mass and incorporating aggregate into the holes in an attempt to loosen it up a bit. Ideally, I’ll be able to reduce the bottom of the root ball and maintain some of the new side growth, and fit it comfortably in this “Keizan” pot. It’s from the Tokoname region and is over 40 years old. While the tree may not exactly be ready for a pot with this much age, it will grow into itself over the next several seasons. Finally, although it’s no longer hosted on the original website, here is some additional reading about the history of Shimpaku junipers, their rise in popularity as collected species, along with some early specimens, and some descriptions of regional variations. It’s well worth the read. Thanks for reading! Please feel free to leave a comment.